I love military SF. 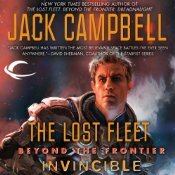 The series of books by Jack Campbell that detail the adventures of now Admiral Jack Geary are like crack to me. Well written and carefully planned out, they show the breadth and depth of military operations as well as the human side of the force. The author doesn't cheat to make sure that battles are too easy, and every victory comes with a price. After defeating the Syndicate in the first series, John and his fleet are sent out to explore and obtain more information about the Enigma race that was driving the actions of the Syndicate. And in the events of the first book of this new series he learns more about the Enigma's and is driven to encounter even more alien races. The fun part of this series is that John Geary is never left in a comfortable place. After being frozen a hundred years the society that he returned to was quite alien to him, and just as he was becoming comfortable he is now forced to contend with the truly alien aliens. I cannot wait until the next book!